*Update: sapsucker continues in PM, 25 Nov 2012. Same location on same pine. 27 Nov 2012, seen in AM, "one tree to the left" (that would be to the west) of the previously preferred tree - Alton Patton. 29 Nov 2012, present. 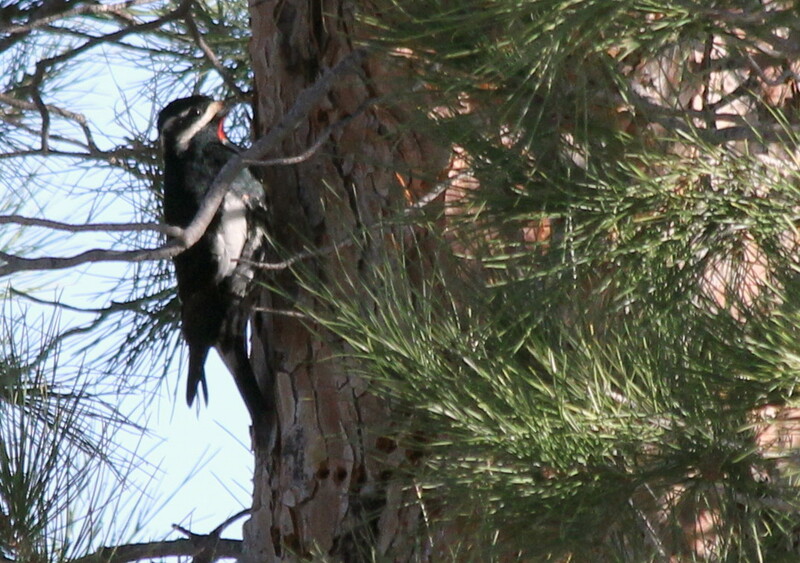 It was successfully fending of a male Red-naped Sapsucker when I arrived at 1242 hrs. I was then flitting between the 3 trees to the left/west of the short pine. 30 Nov 2012, present. Seen by PM observers. 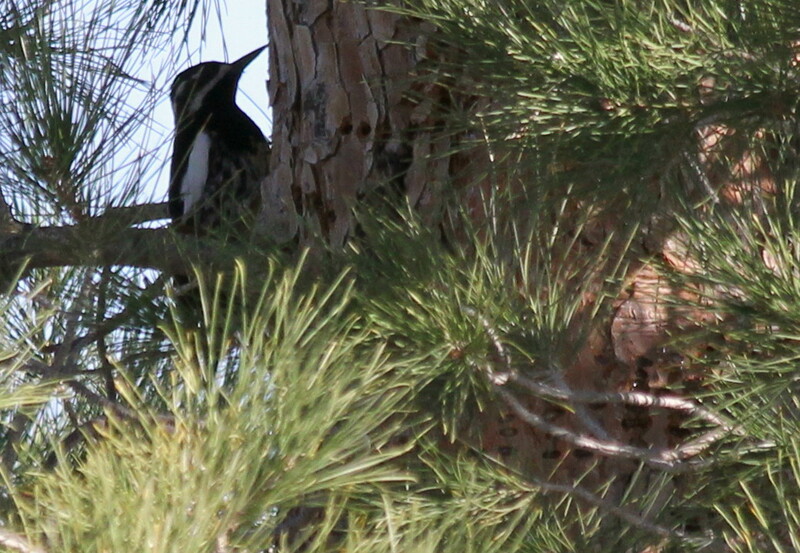 On the afternoon of Nov 21 Willie Sekula found a male Williamson's Sapsucker in the cemetery at Marathon. Latest Reports: Nov 22: continues. Last report at 5:30pm by Joe Fischer. Nov 23: present early morning. Nov 25: 9:45am, present until 10:15am when was flushed & pursued away by overly aggressive photographer. **when was flushed & pursued away by overly aggressive photographer. **this was not the two of us (myself and Heidi), however I will make brief mention at the end of this post. Willie Sekula told me it was actually Derek Muschalek that found it. Nice, Derek! 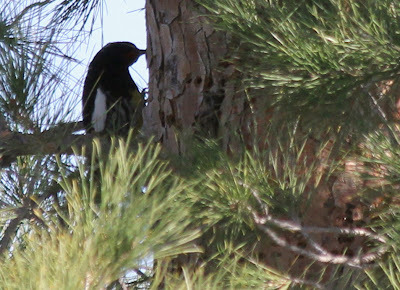 This bird is generally found in higher elevation, mixed-pine forests. They do come down in elevation in the Winter. The "best" spot to generally see a bird or two in Winter months in Texas is at Lawrence E. Wood Picnic Area in the Davis Mountains (Jeff Davis Co.). That's on the scenic loop a few miles past the McDonald Observatory. A male Williamson's Sapsucker rolled down the hill and was reported by two aforementioned knowledgeable birders on 21 November. 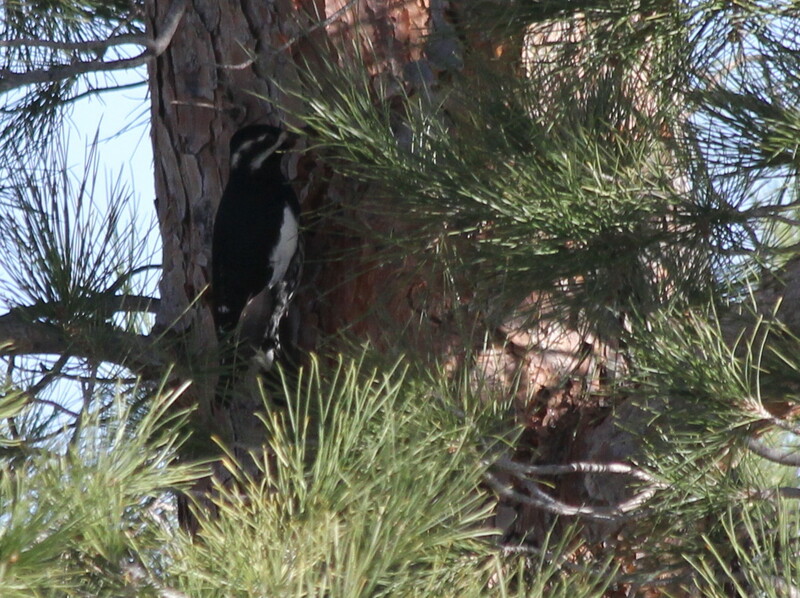 Sapsuckers are woodpeckers, Family Picidae, that specialize in drilling evenly spaced holes in trees. They then re-visit these trees for the sap and the insects attracted to it. This guy has been working this particular tree for days, as it was this morning. This bird was focused in on this shadow-side of the pine. It was also well sheltered. Limbs and pine needles obscured a clear, open photo. However, our 40 minutes of observation were absolutely perfect. Watching a beautiful male Williamson's Sapsucker do what it does best, in fact, do what it MUST do. It found a portion of that pine's trunk that was (must have been) entirely suitable for it's specialized methodology to obtain food. It was working on that little, shaded, somewhat obscured nook for our entire observation. **As we departed we noted a periwinkle SUV parked directly beneath the bird's favored tree. The two individuals in the vehicle preceded to flush the bird several times, as we were leaving. The man's camouflaged lens, a huge lens the size of a small child, was wielded out the vehicle. So as not to go into a complete rant of a vignette I'll keep it short. 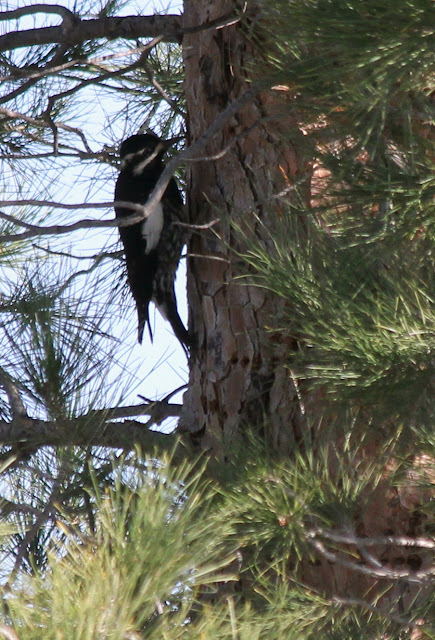 The couple flushed the bird from its favored pine. It was then pursued to a nearby pine where it was flushed again. The man, with the Light Anti-tank Weapon of a lens, walked toward the new pine it flew to. Never stopping his progress toward the base of this pine or any other, the sapsucker was flushed again. As birders, as ehem.. photographers (we carry a camera, too), as those interested in the native wildlife around them, we have some moral obligations. It all comes down to not harassing the very subjects we are so interested in. Sometimes our moments of observation are not as desirable as we would have hoped: that's how birding goes. Sometimes our moments of nature/bird photography are not as desirable as we would have hoped: that's how nature/bird photography goes. Anyhow, what a beautiful bird to observe. We hope it continues to stick around. There exist plenty other pines in that cemetery should its noted "favored" tree be left behind. I would still listen for the light tappings and point your optics toward that particular tree for starters. We found that parking in the bare area near the center of the cemetery gave us ample room to begin scanning and listening. I love your posts. Yes, there is nothing quite as wondrous and earcatching as the sudden sound of a woodpecker feeding in quiet woods---we have a good number of different peckers commonly up here in Maine(current governor included?) with Pileateds being the largest and loudest and most shy. Jane B.
I cannot condone the behavior of this photographer if indeed your description is ground truth and unbiased. With the advent of digital and comparatively inexpensive equipment (as compared in real dollars vs. 20 years ago), there are more and more people out there with more glass than brains because they're not paying for consumables (film, developing, etc). Had he been smart he would have used his SUV as a blind if his glass was as big as described, and at 30' he would have done just fine. However, you failed to keep from turning your description into a rant--both here and on TexBirds. It came off as snooty, snotty, obnoxious, and elitist. I detect a level of bias persistent and sadly prevalent in many of the "old school" birders, out to seek the purity of observing birds, against photographers who heaven forbid want to both make a nice shot and share it with those who would love to see birds (and may inspire the next generation of birders). The same types of folks who will complain about the shutter noise in a blind because it will scare the birds but will carry on a non-stop conversation loud enough to be heard at the next state park. Maybe I'm wrong, but the hyperbole in your verbiage describing his lens as "Light Anti-Tank Weapon" and "size of a small child" tells me that he could have sneezed inside his SUV and you still would have been upset with him for harassing the bird. And if indeed that big, he wouldn't have been able to handhold the lens so his adventure outside of the vehicle would have been fruitless because he wouldn't have gotten a shot without camera shake. And speaking of the ABA code of ethics, did you take a few minutes after you witnessed the alleged unethical behavior to consider speaking to our wayward photographer? While stretching just a tad (it would be, at best, an improptu group), 4(b) of the code recommends that we do this. In short, I cannot trust that you words are not clouded with prejudice against photographers based on your rant. And before you toss this into the pile as being just another self-righteous, privileged photographer who couldn't care less about the birds and birding, I am a past member of the board of advisers of Friends of San Angelo State Park, specializing in maintenance and upkeep of the bird blind and responsible for numerous birding programs for scouting groups and the park's summer camp. You know, teaching the next generation of birders who are going to carry on this hobby long after we've made out last life list entry. And I do most of bird photography in a blind and without flash. I wish we could all get along. Maybe the next generation of birders and photographers who can figure it out. What we did not post on any forum is that we did, from our aforementioned distance, flail (if that's the proper word) our arms and make some exasperated gestures - we were leaving when they got there and that seemed a reasonable action if people could take the hint. Admittedly, when they first pulled up, I was anxious to go update them on the sighting and then realized they'd parked so close enough as to flush the bird... we weren't in the mood to be birding police, nor seek conflict. At that point, they needed no update on the bird's location. Ideally the photographer would have realized how close was too close, but this fellow was not "the next generation" of birders in terms of newness on the planet, though perhaps to photography or birding. Thank goodness for the "next generation" that gets to learn from the mistakes of others! I do carry a camera and do admire folks with the time and dedication that it takes to get the amazing shots that are out there - I just wish that photographers shared some sort of code of "don't harass your subjects" that most/many birders share. That said, I also go for macro subjects because everyone and their cousin is crowding out birding areas, while insects are everywhere and generally allow for a close approach. Our sarcasm in describing the photographer's lens (it was small compared to the guy who waded out into a lake at Santa Ana NWR) is coupled with some exasperation out here. Folks just don't seem to understand that this region is still barely hanging on by a thread after last year's fires and the persisting drought. Everything that's out here needs an extra bit of room. I hope that you'll consider our rant as not an attack on photographers, so much as people who follow directions literally to the bark of the very tree they are seeking and proceed to be inconsiderate of those around them. Birds and humans alike - if we had arrived shortly before that SUV and parked on the far side to work our way over, the experience would have been equally, if not more, distressing. We want to share and spread knowledge out here, but it's folks like that who cause property owners to restrict access. End of story. All the best, and keep up the grooming of the next batch o' birders! My only real point is that it came across as an attack, twice, because of the broad brush that seemed to be applied. Many photographers do abide by a strong ethical bend. I'm not one to chase a subject around and I'd much prefer to sit tight and let subjects walk away rather than flush them out. But sometimes stuff happens and even with the best of intentions we fail. If I'm an established hiking trail and I flush a bird, there's not much that I can do, regardless of if my intent was to make an image of it. You'll always notice the one not doing the right thing, but the other 8 or 9 of us often will never get noticed because we're doing it right and we're doing it discreetly. I am 100% behind shooting in blinds because I think it impacts the birds the least, provided that what is being offered to the birds in terms of food is appropriate and kept clean. I also believe that the best blind can be a car, provided that it is not at the base of a tree. Unfortunately, often we are kicked out of blinds or made to feel unwelcome by birders-first folks as mentioned above. And yes, once summer gets moving in full-force, 9 times out of 10 I am also making images of flies, spiders, odonata, and reptiles. More shooting material, though more strange looks when people ask what I'm doing. If you're good, I'm good. Your explanation is understood. Understand my point and especially that sometimes sarcasm doesn't translate well non-verbally (I'm a big fan of the [/SARCASM] tag...) No personal attack from this corner, just a commentary on tone and reception. Two posts, from two people, in two places. Twice the rant! Maybe thrice, since Facebook Texbirds and Texbirds are different things. ...the strange looks are priceless. Some of the best outreach/education opportunities come from handing a cicada to a stranger and explaining the joys. If we can admire and explain the smallest of creatures, the rest are assumed to have their place as well. "I cannot condone the behavior of this photographer if indeed your description is ground truth and unbiased. With the advent of digital and comparatively inexpensive equipment (as compared in real dollars vs. 20 years ago), there are more and more people out there with more glass than brains because they're not paying for consumables (film, developing, etc). Had he been smart he would have used his SUV as a blind if his glass was as big as described, and at 30' he would have done just fine." "Maybe I'm wrong, but the hyperbole in your verbiage describing his lens as "Light Anti-Tank Weapon" and "size of a small child" tells me that he could have sneezed inside his SUV and you still would have been upset with him for harassing the bird. And if indeed that big, he wouldn't have been able to handhold the lens so his adventure outside of the vehicle would have been fruitless because he wouldn't have gotten a shot without camera shake." He parked directly at the base of "Tree # 11." He held the camera body with one hand, and propped the camera lens withe the other hand and bent elbow. "I wish we could all get along. Maybe the next generation of birders and photographers who can figure it out." Jim, if you are looking, hoping, and/or bracing for a fight on this you have come to the wrong place. So don't fall over. "snooty, snotty, obnoxious, and elitist"
Jim, we are so very far from the elitists in this society. However, I may have a bit of a cold. "Warmest regards and Happy Holidays - jim"
"The man, with the Light Anti-tank Weapon of a lens, walked toward the new pine it flew to." And I say again, had he indeed had a lens that big, he would not have been able to hand-hold it successfully so the walk would have been fruitless. Nor would he have achieved much from his parking spot or the technique as described--likely all he got was images of the south end of the bird's digestive tract and a lens that big cannot be held steady in the manner described. See also "more glass than brains." My desire is never to fight, but to communicate that my impression of both posts (both here and TexBirds) were as characterized above, with emphasis on the tone (intended or not) that someone interested in making a nice image was somehow on a lower rung than a strict birder. When the ABA Code of Ethics gets surgically inserted into the conversation, that is usually a sign that if you're not birder first that you really don't matter. I have been around the community of birders long enough to know that song. I'm sure the person behind the post is not any of the adjectives listed--if they were they'd have an awful small circle of friends. But the tone that came across to me as a person who lives in both hobbies was as described. Tone and verbiage is everything when non-verbals and vocal inflection is not available. I'd have called it about 1/2 the length of an extended LAW, it certainly wasn't a full three feet. More like elbow-to-fingertip length of the grown man wielding it. It really doesn't make any sense as to why that lens was so close to the bird. I like the "more glass than brains" line, but I'm afraid I'd be ridiculed if I used it. 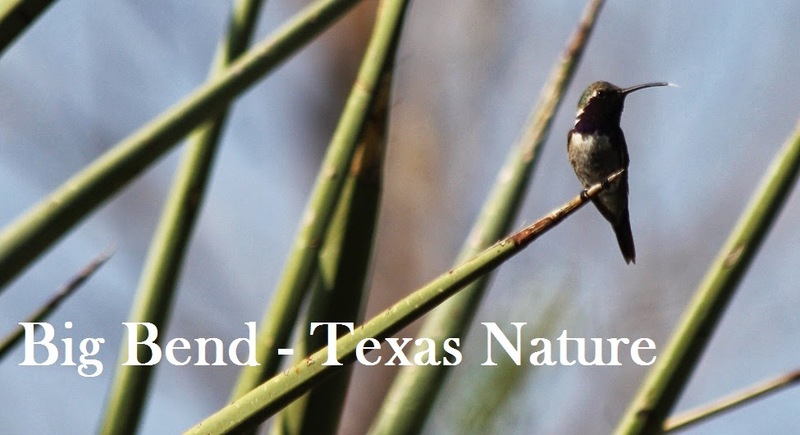 I do ask in all sincerity, if a photographer is after a "nice image" ...why use the RBA or Texbirds to find one particular bird that is so well staked out, if the goal is a nice image? If you're after WISA, why not go to LE Woods, where it's guaranteed every with a little patience? Or its summer range? If it's a matter of a good image of a 'good' bird, there are plenty of 'good' birds out there - not every blip on the RBA needs a poster-worthy portrait, and often enough those shots aren't attainable on chased birds. Somewhere in the photographer, there lies some priority on bird. Otherwise we'd have glorious photos of excessively common things and less energy expended on tracking down rarities? I certainly hope that the tone caused some guy in an SUV to cringe on everyone's behalf. It's too bad that you felt attacked as part of it. Assuming most photographers do not follow in his footsteps, we have no beef with the rest. Once I was so captivated by a Great Blue Heron that I didn't notice there was a photographer in the car parked beside the ditch. After the bird left he reamed me out - I explained I had no idea there was someone in the car. He had a responsibility to get my attention so I wouldn't interfere. Maybe that's what we need to do - to politely make our needs known to the offenders. Cindy, good points all around - I've managed to avoid "trail-sharing stink-eye" on all but one occasion... a small group on a trail at High Island was stopped, we made eye contact and I peered where they were looking. Seeing nothing, I tried to make eye contact again to determine if approaching them wouldn't flush the bird (also to see if I could unobtrusively pass and continue around the group, but also see what they were looking at). Unable to make eye contact, I slowly, quietly, attempted to approach and was given something of a glare/scowl from one individual when I was still perhaps ~20-30 feet away. No point in pushing it, I backtracked and detoured to get to where I was going. I still have no idea what was going on there. Other than when I'm leading groups that require loud-ish commands, I try to tiptoe through life and avoid conflict as much as possible... maybe I assume that everyone else out there grew up with uncompromising older siblings! Anyway, I do agree that the photographer should have made some indication of his presence if it was not apparent to you that he was trying to get a photo. Otherwise, how strange that he'd get bent out of shape over missing out on a Great Blue Heron shot. I'm sure it wasn't the only one in the area!